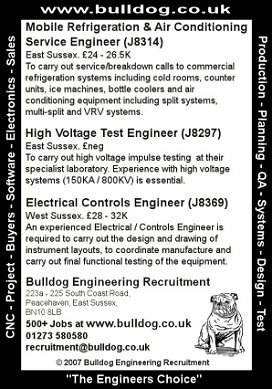 As you may be aware, Bulldog lists its vacancies on this web site as part of its normal service. However, not every Engineer has access to the internet, or checks vacancies on our website. 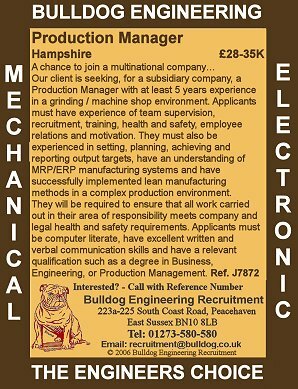 Although Bulldog, as a company, does its level best to fill your engineering vacancies through its own databases, other media such as local newspapers and professional magazines/journals and web sites can also play a vital role in locating and selecting the right candidates for you. For an additional cost, your urgent vacancy can be advertised in this manner (discretely if necessary), attracting a larger range of suitable candidates. We will assist you in the selection of the appropriate media, the costings, copy writing and the planning of the advert. We will also take responsibility for the handling of the responses to these adverts, selecting appropriate candidates and complying with any other specific requirements you have to complete your candidate selection. Adverts compiled for professional magazines/journals related to your industry, as well as your local press. Able to target the advert more accurately, and make it more attractive for your exact requirements. Bulldog handles all the response! We use our expertise to shortlist the most suitable applicants for you. No lost opportunity cost - it leaves you free to get on with other work. Adverts arranged for professional magazines/journals related to your industry, as well as your local press. You pay a percentage of the cost, depending on the number of other clients/vacancies listed. Likely to get a larger number of applicants, but many could be less suitable. Call us on [+44] (0) 1273 580-580 or Email us your requirements and we will get back to you.